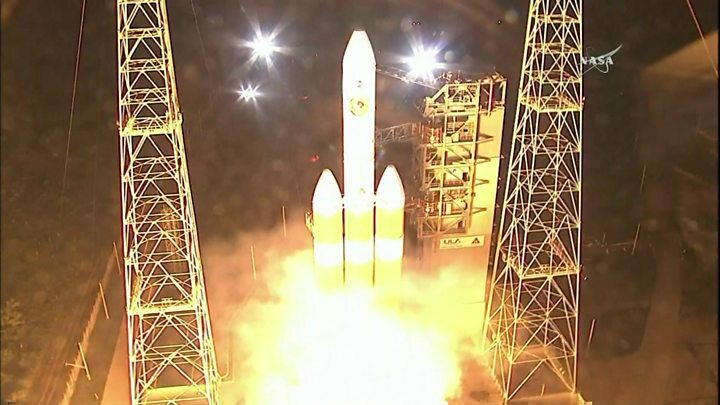 NASA on Sunday blasted off a $1.5 billion spacecraft toward the Sun on a historic mission to protect the Earth by unveiling the mysteries of risky solar storms. "Why is the corona hotter than the surface of the sun?" "It can impact our technology, it disrupts our communications, it can knock out satellites, it creates a hazardous environment for astronauts, and it also can even impact our power grids here on Earth", says Alex Young, NASA Heliophysicist. The unprecedented sun-skimming probe that lifted off today from the USA is set to study the "solar winds" proposed in the paper by Dr Eugene Newman Parker, who has now become the first living scientist to have mission named after him. "I really have to turn from biting my nails and getting it launched to thinking about all the interesting things, which I don't know yet, (that) will be made clear, I assume, over the next five or six or seven years", Parker said in a NASA interview. "We are in for some learning over the next several years", Parker told NASA television. Liftoff took place from Space Launch Complex 37 at Cape Canaveral Air Force Station in Tampa, Florida. A few seconds after that, the upper stage's single hydrogen-fueled Aerojet Rocketdyne RL10B-2 engine ignited to continue the climb to space. The Parker Solar Probe carries a lineup of instruments to study the Sun both remotely and in situ, or directly. It is due tol fly past Venus in October, which will set up the first solar encounter in November. The probe, which aims to give Nasa an up-close look at how our nearest and dearest star works, will travel at 430,000 miles an hour - faster than any spacecraft in history. It eventually will get within 3.8 million (6 million kilometers) of the surface in the years ahead, staying comfortably cool despite the extreme heat and radiation, and allowing scientists to vicariously explore the sun in a way never before possible.